Welcome to my new blog! I've set this up to share my photography and other stuff. 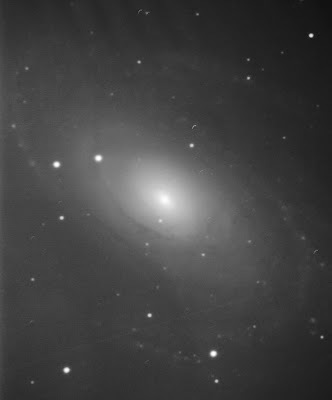 Here is an image I took last night of the galaxy M81 in Ursa Major. 56 minutes total exposure. The nearly full moon washed it out more than I had hoped, and a couple satellites wandered through as well. I will try this galaxy again on a dark night in the Spring when it's positioned much more favorably in the sky.